| Just how stupid does this movie have to be for people to get the point? Let me start by saying that if you're expecting subtle humour, you're in the wrong theatre. It's low-brow and heavy-hitting. But he's not out to tickle your funny bone. He's got the sledgehammer out and he's drawn a bead on the side of your head. But fear not. As movies go, this is a fairly gentle education. Oh, also, heavy on the swearing, but once again, Mike Judge, not Fred Rogers. Was this movie called 'intelliocracy'? F*** no. The gem, the essence that is Mike Judge is that he has the ability to make people laugh at themselves. Beavis and Butthead was most popular with teen-aged boys, the very people at which it incessantly poked fun. With that in mind, I don't think the humour in this movie is aimed at the super intelligent. Maybe you are all too smart to get it. But he's not aiming at you. He's aiming at your average Joe. And he's got a message: get your act together and for god's sake, study botany! It is a little disjointed and the narrator gets to be a little irritating after a while, but once again, this movie is meant for people who need a lot of narration ;-) It's funny. It has a message that it wants to make sure that we all understand. 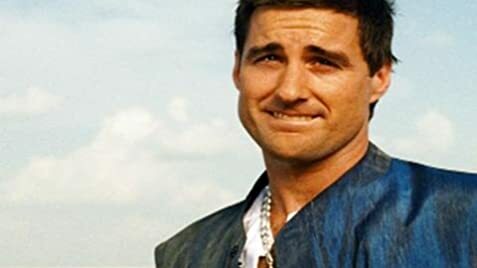 I question the casting of Luke Wilson in the role of a man with a 100 IQ. Sometimes, he's not able to play down (what's he got, like, a 104?) to the level of his character. Slightly forced at times. Kudos on Dax Shepard in this one. I remember seeing him in Zathura and thinking, "This guys looks like an idiot." In this movie, he makes a great idiot. Maybe I'm psychic. It took a while to warm up to Maya Rudolph, but I gave her a little leeway. After all, she did have to play straight man to an entire planet. But once she got a little screen time, she made a solid contribution. Terry Crews played the same psychotic, aggressive character he's played many times before, but he makes a first-rate president none the less. Another bonus is that the place was practically empty. Counting my girlfriend and I, there were literally six people in the theatre. We could've had a barbecue pit and a mariachi band. So, no annoying people talking, as appears to be the norm in the 'talking-to-the-tv' age. All in all, a good premise and a competent delivery, given the intended goal. Lots of laughs sprinkled throughout. They're all pods, all of them! Although the marketing campaign for this film went unnoticed, 20th Century Fox licensed the "Brawndo" drink for sale. The drink itself has gained a cult following, though it is no longer available for purchase at www.brawndo.com. Throughout the character listing, Joe Bauer is listed as "officer" or "private". He is actually a Corporal. A note near the end of the credits says "This film was also cut entirely on a computer".